Colombian President Juan Manuel Santos says his government is ready to start peace talks with the country's second-largest left-wing rebel group, the National Liberation Army (ELN). The announcement comes a day after the ELN released a Canadian hostage it had been holding for months, Gernot Wober. Meanwhile, a Colombian court has rejected appeals against a law facilitating talks with rebel groups. Colombia has already opened talks with the largest rebel group, the Farc. But it had refused to negotiate with the ELN until the group had released all of its hostages. 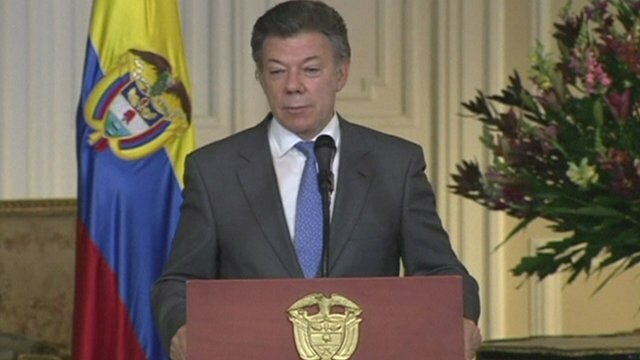 Mr Santos indicated talks would begin as soon as possible. In a statement, he said the release of Mr Wober was a "gesture that I celebrate and appreciate". "At the same time, there was also a statement from the ELN commander reiterating his desire to negotiate peace. I want to tell him that the government is ready to take that step, too. "Hopefully we can now agree on the necessary procedures to start a dialogue with the ELN as soon as possible, to see if we can end the conflict once and for all," he said. Mr Santos did not offer details on the negotiations, but in Colombia many expect Uruguayan President Jose Mujica to play a key role, says BBC Mundo's Arturo Wallace in Bogota. 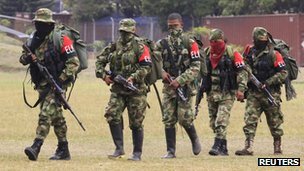 The ELN, founded in 1964, has about 2,000 members, officials say - far fewer than the Farc (Revolutionary Armed Forces of Colombia). The ELN has previously said that it wants to hold peace talks with the Colombian government. Mr Wober, an executive with Toronto-based Braeval Mining Corp, was handed over to the Red Cross on Tuesday in the north of the country. He had been seized in January along with five other workers who were released shortly afterwards. The ELN's commander, Nicolas Rodriguez, said the release was a humanitarian act. "We hope that this effort contributes to a healthy exchange and support for peace in Colombia," he said. Late on Wednesday, Colombia's Constitutional Court rejected a challenge to the Legal Framework for Peace, a law which paved the way for peace talks with rebels groups. The law, which was approved by Congress last year and is backed by Mr Santos, provides for more lenient sentences for rebels if they confess and compensate victims, and agree to lay down arms. However, it has been criticised by the opposition and human rights groups for being too forgiving and potentially leading to impunity for past crimes. Flash floods in one of the driest regions in the world - Chile's Atacama desert - leave two people dead and 24 missing, officials say. Tuesday's devastating attacks in Brussels show IS's European network is still at large, despite a year of intensive efforts by security forces to close it down. Scientists are debating whether it's possible to harness the power of gravity for interstellar space travel. The four-year-old boy who has become the centre of a controversy between India and Pakistan - and between his father and mother. Why, almost 60 years after he first appeared in the Daily Mirror, is a layabout lout from north-east England still so loved around the world?